The Orflow10 workshop will take place in the UIB (University of the Balearic Islands) Campus. It is located outside the city, about 7 km North, in the road from Palma to Valldemossa. The lecture room will be the Auditorium in the "Son Lledó" building, and coffee breaks and meals will be served nearby. 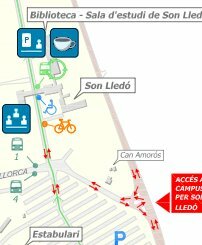 Please, click here for the location of Son Lledó building in the UIB Campus. Or here to get a printable version. 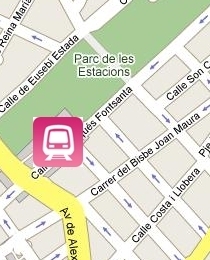 Transportation from the city center to UIB Campus is made easier by the Metro line, departing from Plaça d'Espanya. Check further indications in the Transport section below. A special registration session, during which a cocktail will be served, will be open on Sunday (June 6th) evening (from 7 to 9pm) in "Sa Riera" building, which is a downtown part or the University of the Balearic Islands. The building is very close to the hotels as you can see in the map. The exact address is: C/ Miguel de los Santos Oliver, 2. All the hotels are close to each other, in the area of Paseo Mallorca/Jaime III and at walking distance (between 10 and 20 minutes) from the Metro station (see 3-Transport). A map of the city with the location of the three hotels can be found here. Palma de Mallorca is very well connected with the rest of Spain and Europe (specially Germany, the UK, Austria, Switzerland and Scandinavia) with its international "Son Sant Joan" airport (airport code PMI), the only airport in the island of Mallorca. The airport lies 8 kilometers east of Palma. Bus: EMT Line 1 Bus, Harbour-Airport (The stop is outside the Arrivals' Hall and, on average, there is one bus every 12-15 minutes). Ticket price: 2 EUR. For Hotel Palladium please get out at "Passeig Mallorca 38" and for Hotels Jaime III and Almudaina at "Passeig Mallorca 18". Metro (subway) is the recommended transportation between Palma downtown (Plaça de Espanya) and the UIB Campus where the workshop will take place. Travel time to "UIB" is 13 min. Plaça de Espanya-Estació Intermodal is the first (and central) station and UIB is the last station of the line. There are four services per hour, at 0, 15, 30, and 45 minutes every hour from 8 until 20. Ticket price is 0.90 EUR. Please, keep the ticket until the exit, since it is needed to leave the station. A return ticket can also be purchased for 1.70 EUR. After arriving to the UIB Metro station, you can take the circular free UIB bus, and get off at the first stop, "Son Lledó". The Orflow10 conference room is just opposite to the bus stop. You can also walk there (10 minutes). It is also possible to go to the University by bus, using buses 19 or 20. The price of a one-way ticket is 1.25 EUR. To use the city bus line #19: The recommended stop is "Comte de Sallent, 16" (to go to the stop it is necessary to cross the avenue). Please, get off at "Son Lledó". It is recommended that you allow approximately 30-40 minutes for the trip. For more info on this bus, please check here. To use the city bus line #20, the stop "Avda. Jaume III" is very close to the hotels (see map), but the bus makes a longer way to go to the University, taking about 40 minutes to the "Son Lledó" UIB stop. Thus the recommended transportation is really the Metro. For more info on this bus, please check here. The UIB Campus is located 7.5 km North from Palma downtown, and is in the middle of a scenic landscape, and quite close to the mountains in the "Serra de Tramuntana" range. A map of the campus can be found here. Google Maps have a nice bird's-eye view (but not up to date). In this portal you can find all the maps you wish. Este texto no debe aparecer en nigún sitio ni se debe poder copiar etc, pero eso va a ser dificil de conseguir, lo sé, y además debe ser un texto largo para que ocupe más de una linea y funcione el diseño.